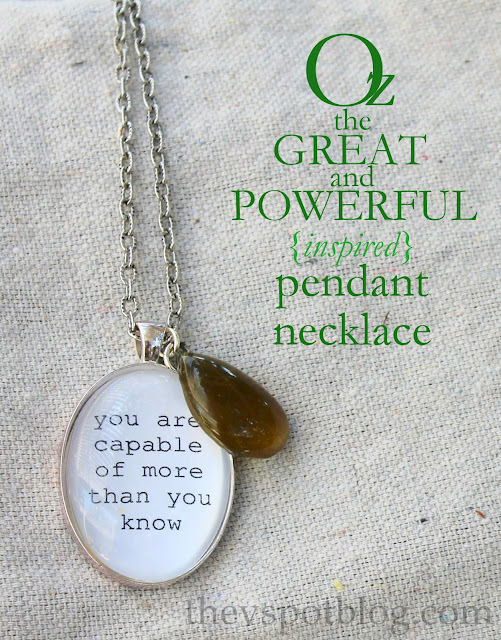 “Oz the Great and Powerful” inspired pendant necklace. 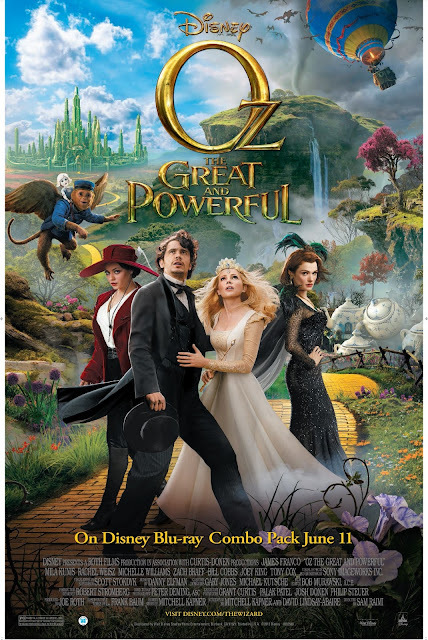 I recently received a fun challenge: I was given a copy the new Blu-ray Combo Pack for Oz the Great and Powerful. I was asked to watch it, then to create something that was inspired by the adventures in the Land of Oz. Well, let me tell you that visually, this movie is stunning. There is so much color, such amazing costumes, fun special effects… but the thing that inspired me the most wasn’t visual… It was verbal. Glinda, the good witch tells Oz the Wizard that he is “more capable” than he knows. I think we’d all do well to remember this about ourselves, whether we are exploring in the Land of Oz or going about our day to day life in our own home town. So I made an easy Oz the great and Powerful necklace to help promote that message. Print out your quotation on a piece of paper. I chose the “courier” font, so I wanted plain white paper to create a stark contrast. (The quotation itself is pretty cut and dry, right?) Cut the paper to fit your pendant form. 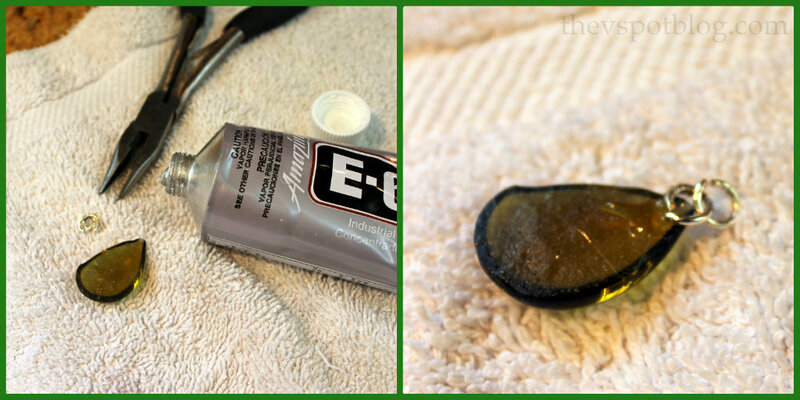 Make sure it fits properly, then put a dab of glue to make sure your quotation stays in place. 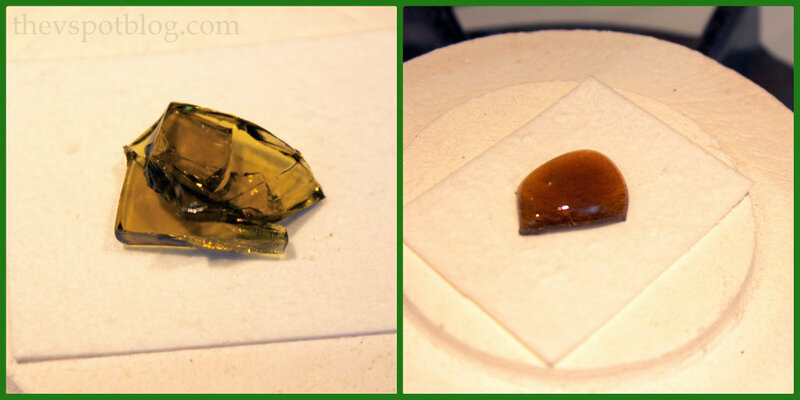 For the green glass bead next to the quotation pendant, I made my own by using a special microwave kiln that lets you fuse small pieces of glass. I wanted to have some green to tie in with the Emerald City, so I broke up an empty wine bottle and fused a few bits of the broken glass together. Next, take your fused glass or your beads and glue a ring to the back of the bead. Then add your jump ring. The Blu-ray Combo Pack is available TODAY! You can click HERE to see where you can get yours. You can also follow the happenings on Facebook, Twitter and Pinterest! I was compensated for this post. All opinions are 100% my own. Be sure to check out all of these fabulous Oz inspired projects and treats! Great necklace Viv. So pretty, and I love the saying you chose. What a great necklace! I love the quote and it looks so great with your cool glass pendant! My daughter collects all things Oz. This is something she would love. Thanks for sharing. Where did you get the kiln? Oh and I pinned! Beautiful necklace and I love that kiln! 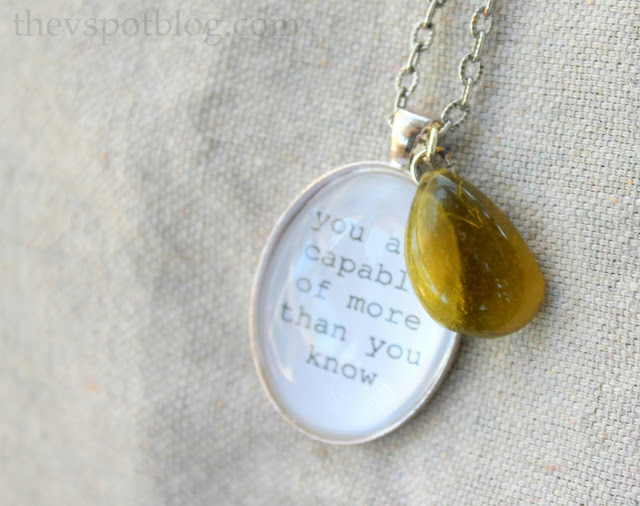 Life's been rough lately, and reading the quote on this necklace was powerful. I just rented this movie this morning. I can't wait to watch it. Thanks for the inspiration this morning. 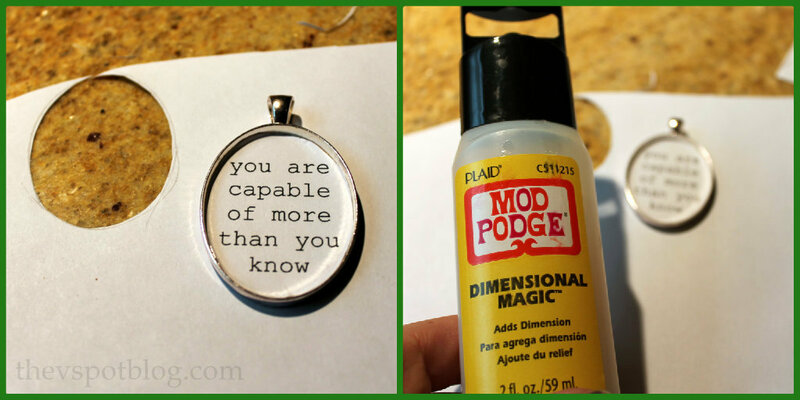 I didn't realize the power of Glinda's words in the movie until you put them on a necklace. Wow. Darling Viv, I learned a lot from this post & the one after it! I didn't know about Dimensional Magic Mod Podge or the kiln! Thanks for the inspiration. I love your beautiful necklace. Are you coming to the Breathing Space conference? Skeleton Key Stenciled Mirror with Mod Podge Rocks stencils. Turn Dollar Store beverage napkins into easy Halloween hurricanes. Taming counter-top clutter with canisters. Make a Monogrammed ornament the old fashioned way – without an electronic cutting machine.